Upon arrival, sign in and be sure audition form is submitted. Actors will have a head shot taken to help the director to identify each one. 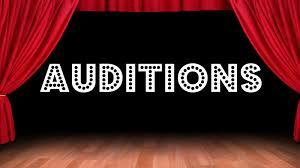 Actors will be taken in small groups to the stage to audition in front of the director (Devan Ward) and stage manager. This will take place on the stage, but behind the closed curtain. During the audition, actors will be asked to read from pages of the script. Also, actors may be asked to share a brief story about something scary that has happened to them.